Emergency services carry dead bodies of migrant died in a sinking boat trying to reach the Greek Island of Kos on Tuesday in Bodrum, southwest Turkey. Six Syrian migrants, including an infant, drowned off the Turkish coast Tuesday as they tried to reach a Greek island, a rescuer said, underscoring the deadly risks taken by migrants making even short crossings to Europe in overcrowded smugglers’ boats. Three more migrants survived for hours in the motorboat’s overturned hull, breathing air trapped in a pocket, before being rescued by divers, the emergency worker said. Those who drowned were attempting perhaps the safest, shortest sea crossing in the risky journey to Europe, for the Greek island of Kos is only four kilometers (2.5 miles) from Turkey at its closest point. 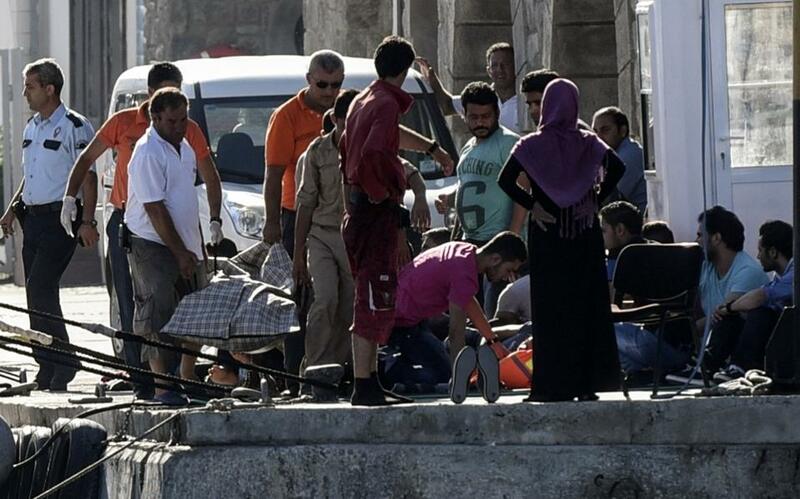 Turkish coast guards unloaded five body bags at the harbor in the western tourist town of Bodrum as the rescued migrants, one man clutching his head in his hands, sat on the wharf. A rescue team later found the drowned infant’s body, said a member of the Bodrum Sea Rescue Association, who spoke on condition of anonymity because he was not authorized by coast guard officials to talk about the rescue. The Turkish divers pulled a child and two men out alive from a sealed area of the capsized boat, a 9-meter (30-foot) motorboat, the rescue official said. Medical staff carried a wailing young boy, an oxygen mask around his neck, and a man to ambulances. It wasn’t the only rescue Tuesday in the Aegean Sea. About 20 other migrants were picked up by Turkish authorities and taken to the nearby town of Turgutreis. It was not clear what boat they had been on. A Doctors Without Borders medical team heading for the Greek island of Leros chanced across a boat carrying 40 migrants, some of whom were in the sea, picked them up and took them to Kos. Men hugged and kissed one another as the group, which included young children, reached land belonging to one of the European Union’s 28 nations. "It shows that there is a need to increase the capacities in the search and rescue operations here," Doctors Without Borders field coordinator Elisa Galli said. Yet the numbers of migrants attempting perilous sea crossings to Europe continue to climb despite the risks. Greece’s coast guard says it rescued 576 migrants in 23 search-and-rescue operations off the islands of Lesbos, Chios, Samos, Agathonisi and Kos in the last 24 hours. Before that, Greece reported more than 135,000 arrivals from Turkey this year. As of Saturday, Italy said another 103,000 migrants have been rescued at sea and brought to Italy. Along with those landing in Spain and Malta, that means more than 243,000 migrants have reached Europe by sea so far this year, compared to 219,000 for all of 2014. The International Organization for Migration estimates at least 2,300 people have died this year trying to cross the sea to Europe.